← Mashing MyFridj.com with TipIt.to? The Chennai Social Mediarattis Ganesh APP(sagaro), Bhargav Ramakrishnan, Mahendran and others are attempting photo sampling of Chennai. They want to play ‘Freeze’ with whole of Chennai on Third November at of course 3:11 PM. They are want to use the wisdom of crowd to capture the moment as photos and pickle it forever at flickr. All you have to do is sync your device that alerts your sense of time( your watch, clock, mobile, PC clock, sundial , wall clock in the shop nearby, anything) with global time, then be ready with a image capture device( digital cameras, analog cameras, webcams, mobile camera, obscure image devices). At the specified time(3:11PM on 03 Nov 07) you just use the image capture device where ever you are, to capture a snapshot of life as it happens in Chennai. This is not for any great worthy cause, this is not a competition, it may or may not help charity, it will not prevent global warming, you will gain no medals, no certificates but it is most definitely not a waste. I’m contemplating adding a Amazon Mturk twist to it by creating Chennai 311pm HIT in the Mturk Human Intelligence Task market. Update: Not in Chennai during the event? SecondLife and Avatar Voodo to the rescue! 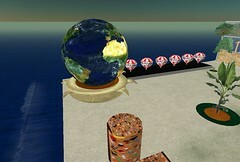 Now you can participate virtually via SecondLife, and With Avoodo Make It Real! This entry was posted in Chennai, crowdsourcing, crowsourcing, Entrepreneurship, Idea Factory, mturk, Web 2.0 and tagged chennai 311pm, flickr, photo sampling, sagaro. Bookmark the permalink.